The Israeli Air Force has hit roughly 150 terrorist positions across the Gaza Strip as of Tuesday morning, following the latest wave of 50 strikes. An IDF spokesperson reported that the targets were tied to the Hamas and Islamic Jihad terror organizations. The Hamas targets hit by the IDF in its latest wave of strikes included a terror tunnel in Darj; four compounds used by terror groups in Gaza City, Khan Yunis, Beit Hanoun, and Jabalia; and a position used to launch rockets from Khan Yunis in the southern Gaza Strip into southern Israel. 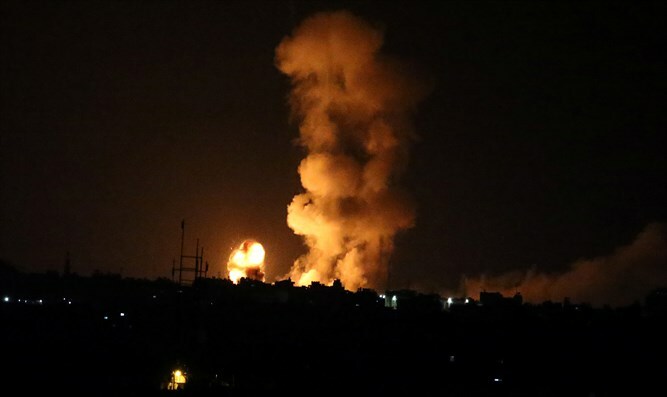 The Israeli Air Force strikes also targeted two Islamic Jihad compounds in Khan Yunis, and compounds used by the terror group in Deir al-Balah and Tel al-Hawa. According to an IDF spokesperson, the airstrikes are still underway at this time. Earlier Tuesday morning, the IDF reported that nearly 400 rockets and mortars had been fired from the Gaza Strip into Israel. Approximately 100 projectiles fired from Gaza into Israel were shot down by the Iron Dome missile defense system. One person was killed and another injured when a rocket fired by terrorists operating out of the Gaza Strip slammed into a residential building in the coastal Israeli city of Ashkelon. A 40-year-old man was killed in the attack, with several others injured. In response, the IDF pounded terrorist strongholds across the Gaza Strip overnight, including the Hamas terror organization’s administrative headquarters. IDF jets bombed the building, disguised as the Al-Amal Hotel, which had been used by Hamas as its interior security headquarters for the past four years.